I use my laptop all day. For me, most days that means from before 6AM to around 10:30PM. They get hot. Every one I have ever used would get hot, no matter what processor the machine had inside of it. I tried mats which worked for a while but they can block the vents. I tried shifting it onto a table and that gave me a stiff neck trying to maintain a fixed position. Solution. I slowed down the processor. In my case, it was only 10 percent and that was enough to stop my leg from turning lobster pink. Your mileage may vary, but just knocking 10 percent off of the maximum speed might solve your problem. You probably won't notice this difference in speed, I didn't. On Windows 7 or Windows 8, or Windows 8.1. Go into your Control Panel. Start, Control Panel. At this point, since Microsoft tends to move things around you will make it easier to find if you set the control panel to view by "Large Icons". The "Choose or customize a power plan" screen will show. The "Plans shown on the battery meter" line that is highlighted and has a button selected is the one you want. In my case it is "Balanced (recommended)" but yours could be currently Power Saver. Click on the blue link that says "Change plan settings" off to the right of the plan. The "Change settings for the plan:" screen will show. 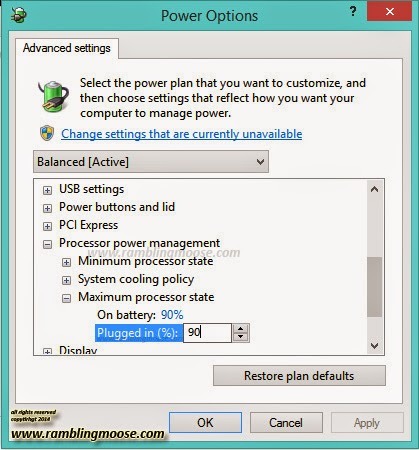 Click on the blue link that says "Change advanced power settings". The Power Options window will open. Under this window, locate the line that reads "Processor power management" and click the plus button to the left of it. Locate the "Maximum processor state" line and click the plus button to the left of it. You can set the "On battery" and "Plugged in" maximum processor speed at this time. Click on the number to the right of the line and the amount will change to allow you to type in a new amount or click on the arrows to raise or lower the amount. Mine is set to 90%.